One of the things we love about this time of year is that we have so many wild edible plants right outside our door. I have discovered (and invented) some delicious recipes. Fritters are one of our favorites, whether they're made with Fiddleheads, Dandelions, Wild Chives, Alaska Ginseng (Devil’s Club) or just about anything else we find in the woods or in our garden. We are especially thankful for all these wild greens because we can’t even plant our garden until the end of May. While my husband has been away guiding for the last 7 weeks, our boys and I have been working extra hard all day. Well, the boys do get a lot of well-deserved play time at the creek. They have been such a help to me while their daddy has been away. The last couple of weeks have provided special treats of new wild plants. Lately, we’ve been stopping work an hour or so before suppertime to go for a walk and gather part of our next meal. It is incredibly satisfying to be able to do that (not to mention FUN), and I am so thankful that we live in such a place. I was brought up in a very large city, and I certainly do not take this lifestyle for granted. I know we have been blessed. I grew up in the Deep South, where a meal was not a proper meal if it didn’t include something deep fried. Tomorrow night, I’m going to add some wild greens and Dandelions to our pizza (not fried, but I’m not complaining!) Tonight we had one of our favorite meals --- Fritters! You can make fritters from just about anything. If you don’t have the wild plants I used this time (recipe below), use whatever edibles you have, even if they’re from the grocery store or a patio garden. Cabbage, broccoli, mushrooms, onions, and many more vegetables all work just fine. Use just one, or a mixture. Add meat, if you like, or leave it out. Add other herbs and seasonings for even more variety. Careful on that. It's easy to overpower the wild greens with too many spices. When I want a sweet fritter for breakfast, rather than a savory fritter for supper, I’ll usually stick with flowers. Dandelion or Elder flowers work great for this. Just remember to use no more than half the salt in the recipe below, and omit the pepper. You can make the batter sweet by adding a few tablespoons of honey, brown sugar, or other sweetener. You can leave out the sweetener in the batter, and serve the fritters with maple syrup, jam, powdered sugar, or whatever else you like. Or, just toss some flowers into your favorite pancake batter. You really can’t go wrong with fritters. If you want them a little lighter, add a tablespoon of baking powder per cup of flour. If you want eggs, use them. If not, leave them out. I use powdered milk and eggs because we live in the bush and I don’t have fresh at the moment. But if you have the fresh milk and eggs to spare, use them if you like. Your fritters will turn out delicious. 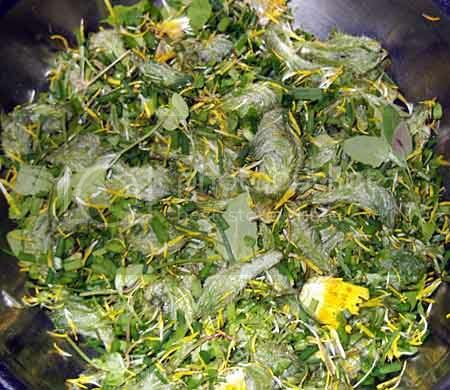 Prepare wild edibles for cooking, and set aside. Preparation will depend on what you use. Today, the boys and I picked some Alaska Ginseng (Devil’s Club) buds, Lamb’s Quarter, Chickweed, Dandelion flowers, Watermelon Berry leaves and Wild Chives. I chopped the Lamb’s Quarter, Chickweed, Watermelon Berry Leaves and Chives. I removed the stems and most of the calyx (green part) from the Dandelion flowers (scissors help with this). The Alaska Ginseng buds required no preparation, but you can chop them if you prefer. A few Fiddleheads and young Fireweed shoots would have also been nice, but it was getting late and I needed to start supper. If your plants have dirt, wash before chopping. Try to avoid places where the plants are near car exhausts, and don’t use plants that have been sprayed with chemicals. If using meat, cook it and set aside. If it is really greasy, drain and discard the fat. Combine flour, milk powder, egg powder, salt and pepper. Stir in 2 cups of water. If it seems dry and thick, add a little more water. If your batter ends up too thin, stir in a little more flour. Stir in the meat and prepared wild plants. The batter should not be like dough, but it should not be watery, either. In a heavy skillet, heat oil for frying. You should have about ¼ to ½ inch of oil. More won’t hurt. Drop tablespoons of the batter into the hot oil. When the bottom is brown, turn and brown the other side. Watch to make sure they don’t burn. If you fry too slowly, they become greasy. When done, remove fritters from oil with a slotted spoon, and drain on paper towels. Serve with mustard, barbecue sauce, or just eat ‘em as they are. We had them with a green salad of new Watermelon Berry leaves, Chickweed, Lamb’s Quarter, Wild Chives, French Sorrel from my garden, and Wild Geranium Flowers. I’ll try to remember to take a picture of the salad next time. Excellent! I think I could manage that. Thank you. Hey this sounds tasty to me. Gonna have to try it sometime. Thanks for stopping by my blog. It is never a problem to direct people to your blog...I enjoy it so much! Looking forward to seeing pics of the puppy. I just found your blog and find it really fascinating. What a courageous family you are! Although our politics are probably not aligned (I am a Progressive), I admire your vision and pluckiness for following through with it. I read through all of your blog and it's been such a riveting read - and educational to boot! I have so many questions for you about your homesteading project but I won't ask them all at once. Thank you for giving me a glimpse in a world so unlike my own yet with certain ideals that speak to my heart. P.S. Oh! The salad greens! They look delicious. What exactly can you do with dandelions? Do you use only leaves or petals or both? Hi,hope all is well with you and yours. Thank you all for stopping by. When you try the fritters, let me know what you used and how they turned out. TGL, I'm glad you are enjoying my blog. Dandelions can be used for many things. I'm working on a blog post right now. 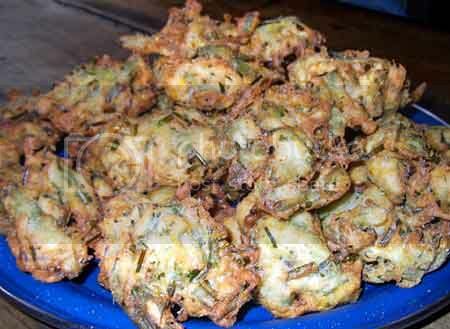 The petals can be used for fritters, pancakes, casseroles, salads, tea, wine, and probably other things. The young leaves (before flowers appear) are good for the kidneys, and to help treat urinary tract infections. Dandelion root strengthens the liver. On your other questions, I looked for your email address on your blog, but couldn't find it. Feel free to email me. It sounds tasty, but I have a big problem with fried foods - I can't stand the smell of it in the house. Any advice? Hi Judy and Ariela! Good to see you! I thought things would slow down a bit after my husband returned, but now it's busier than ever with all the animals he brought home. More on that later. Ariela, on the wild fritters, if you can't stand the smell of fried foods, I don't know what to tell you. Best avoid them, I suppose. Wild greens are delicious in pizza, casseroles, soups, stews, etc. What a fantastic looking dish!! That looks really good. I will have to try a gluten free version of that. Anyway, this fritter recipe is so simple, yet amazing...definately going to copy this one down and put it to use. Thanks for all the "options" as any wild greens here in suburbia are laced with poison (weed killer/fertilizers). I'm going to settle in for an evening of catching up on reading here...your life has always fascinated me :-) I hope your DH got back safe, or is coming back soon if he's still gone (I know I'm super late commenting here). Holy cow! That looks sinfully good! Miss you! Hope all is well. I'm just a lurker, but I used to check your site every day to see what adventures you were having. And since I haven't seen any updates, I got worried that something had gone wrong up there in all that wilderness. I hope all is okay! Thank you all very much for your concern. Things are fine up here. I'll be back to posting soon. I wanted to ask you if you have a recommendation for a starter-level book on herbal remedies (herbal healing, homeopathy, whatever you call it). How did you start to learn all you know? I've been looking into the Weston A Price Foundation, and plan to join it very soon; not sure if they offer something on their site (I didn't see it right off the bat), so I figured I'd ask some folks who clearly know their stuff and find out where you started. Thanks! Thank you so much for visiting, and for the kind words. Lots going on right now. Things should start to smooth out soon, and I'll get back to posting regularly again. I got into herbs and natural/alternative medicine because, like you, I'm a nurse. When I was working in the medical field, I saw so much that was, at the very least, not at all helpful, and much of it was terribly dangerous, especially long term. Very little actually healed. Most modern medicine just covers up symptoms. "Health" really doesn't have much to do with anything in that world. I purchased the book "Plants of Alaska and the Pacific Northwest", by Janice Schofield. That won't do you much good, but it is a fantastic book, especially for identifying plants here in AK. I also took a class from the author through the university once. Then I just gradually began using the plants for medicine. My husband began getting sick one afternoon --- fever, nausea, chills, aching all over, and just generally feeling miserable. He wouldn't even take Tylenol. I felt so bad for him, so I asked him if he'd drink a tea from wild plants if I thought it would make him feel better. He agreed. So I got out that book and started looking for things that we have that would help him get well. We were pretty limited where we were, and I wasn't good at identifying plants yet. But, I gather some birch bark, yarrow flowers and wild mint. Those were easy. I boiled some water, poured it over the crushed plants, and steeped it for the most horrible tasting tea you could ever imagine. I didn't want my new husband to suffer through that awful tea alone, so I downed a cup, too, right before bedtime. When we woke up the next morning, both of us felt better than we'd ever felt! We slept great, and my husband was well. That convinced both of us that herbal medicine is legitimate. One book I love and use often is The Way of Herbs by Michael Tierra. Great, practical little book! Get it! Another that has good lots of good info that might appeal to you is the PDR for Herbal Medicine (or something like that --- definitely a PDR of herbs, but I'm not sure of the exact title. Costco often carries it at a great price. Go to a GOOD local health food store (not a chain store like GNC) and ask for a good book on local plants, or homeopathy. Or, ask them for a good herbalist in your area. They should be able to help you. That would be a great start. Life Extension Foundation is also a wonderful resource. They sell many top quality supplements, but their website also has tons of great articles. If you become a member, you get a huge discount on their supplements. That alone is well worth the membership. Also, you get their health magazine, and I believe they may still be offering a wonderful book on natural health. It's huge, and packed with lots of good info. I hope you will join the Weston Price Foundation soon. Their quarterly magazine is priceless! (pun intended) It is really fantastic ! ! ! The authors of the articles are incredibly knowledgeable. I don't know if I could be considered someone who "knows her stuff", as you said, but I have found reliable resources, and done enough experimenting on my own to feel comfortable with most any medical problem I have encountered in the bush. There are many emergencies I "secretly" pray that I will never have to deal with because I don't know what I'd do (or I'm afraid that what I'd do would not be effective). But, like anything else, the more you read about and use herbs, the more comfortable you will become. Rub some chickweed on a bee sting, but bite or a burn. When you see how something that simple really helps, you'll want to experiment more and more. How awesome is that, to live in such a way, that you can take advantage of what nature has to offer. Ready made salad without much of the hard work. Sorry for the delayed response, please do email. That looks delicious, especially the fried one. I would love to try that. Thanks a lot for sharing.